1. The insurance company calls you immediately after your accident. You start receiving calls from the insurance company of the person who was at fault or hurt you. Keep in mind that you may be recovering in the hospital, seriously injured, or with pain medication. Therefore, you will not be able to make rational decisions. Many times during an initial contact they record the conversation. The content of the conversations that you give to the other insurance company or to your own company is of the utmost importance. The employees of the companies are trained to make you say or admit things that may not be true, and then cut back the money they have to pay you. It is very important that you talk to a lawyer before declaring something. 2. Insurance companies require a declaration. You do not have to make a statement until you talk to your lawyer. If the insurance company demands a statement, you have the right to say you want to consult with a lawyer before saying anything. The attorney can review the case and make a statement for you to the insurance company or assist you with the statement. 3. the damages can be reduced by the percentage of culpability that is granted to him by his accident. If an employee of the insurance company can have you say that you probably had some fault in the accident, this will affect your verdict after a trial. For example, if the total damage is $ 100,000 and your insurance company can prove that you had 20% of the blame for the accident, then you will only receive $ 80,000. If the insurance company can show that you had 51% or more of the blame for the accident, you may not receive anything. 4. Insurance companies blame other drivers or other factors for the accident. Insurance companies will always try to blame everyone except the person or company they represent. For example, they will blame you for tripping over your own foot in the event of a fall accident. In case of car accident they will blame the other driver or you. The insurance company will try to argue to the slightest cause, so as not to blame the person they represent. 5. They do everything possible to delay payments on their claim. Insurance companies delay payments on your claim because as long as the money is "in good hands" and not yours, they make money. These companies invest the money they get from their paid premiums, and the longer they have the money, the better for them. Insurance companies will tell you that they are processing your claim, or that they need more information, or that they do not have complete medical information to evaluate your case. The excuses are endless and the delay is too long. Many times after these delays, they will make you an offer that almost does not cover health costs. Be careful with these delays. The only way to protect yourself is by filing a lawsuit. 6. The insurance company has you sign a medical authorization or a document that frees the insurance company from any liability. The worst trick insurance companies attempt is to have you sign a form to release the person or company they insure from before you speak with a lawyer. 7. Insurance companies use computer programs that do not provide fair amounts for injuries sustained. Many insurance companies use computer programs such as "Colossus." Colossus is a computer program that large insurance companies use to estimate the value of your claim. Colossus puts a lot of emphasis on several factors that negatively impact your claim and reduces the value placed on the person's injuries. One of the biggest disadvantages of Colossus is that, when employees of the insurance company enter the information that the program uses to give value to personal injury claims, Colossus does not consider to what extent people have been affected. On the contrary, it is guided by the data that was given by the employees of the insurance company and the quantities that are calculated are always lower than their real value. After an accident, many times you desperately need the money and insurance companies know it very well and will try to get you to accept much less than your claim is worth. At a minimum you should consult with a lawyer to see if the offer is fair or not. The last thing insurance companies want is for an experienced personal injury lawyer to get involved in this process. The faster a lawyer handles the case, the better. The lawyer will help you not to say inappropriate things that may affect you, and going ahead looking for evidence to prepare your case in a trial. Remember that you do not always have to accept what insurance companies offer you. 10. Insurance companies do not explain all the coverages that are available. Many times accidents have different types of coverage available. An insurance company will not explain all the coverages available to cover your claim, unless a lawyer is involved in the case. In the case of a car accident, what people do not fully understand is that they can sue the person who caused the accident and their insurance company if the insurance does not cover enough for the injuries caused. 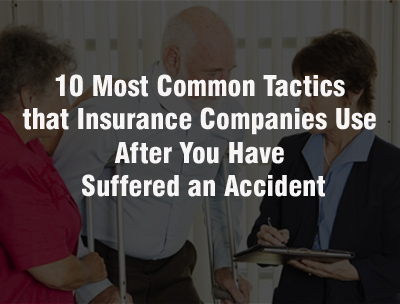 0 Response to "10 Most Common Tactics that Insurance Companies Use After You Have Suffered an Accident"